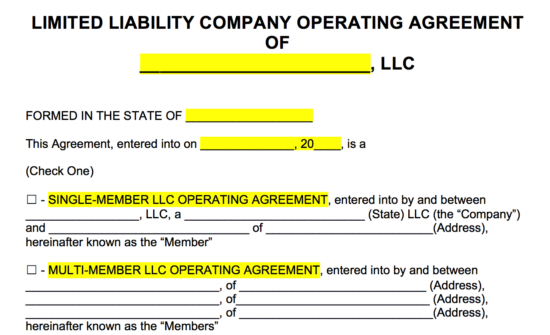 An LLC Operating Agreement is a legally binding business document that entails the ownership of its members, how the company is managed, and the structure of the LLC (Limited Liability Company). It can provide details such as when meetings are held, naming a registered agent, selecting managers and adding/dropping members. Required in California, Delaware, Maine, Missouri, and New York. Single-Member Operating Agreement -To be used by a sole (‘single’) member (owner) of an LLC (also known as a ‘Sole Proprietor’). Multi-Member Operating Agreement – For use by an entity that will have more than one (1) member. An LLC (Limited Liability Company) is a type of business formation that allows its owners (also called Members) to have limited liability protection. This type of protection eliminates a member’s personal risk in the event a creditor attempts to pursue collection for the business’s debts. Once your LLC is considered “Active” by your state, you can then go ahead and create your LLC Operating Agreement. Adding New Members – If a new member is added to the company, which means the LLC Operating Agreement would need to be amended, all existing members must approve with the written consent of that new member. This also applies to an increase or decrease in ownership from one member to the next. Dispersement of Profits – It’s very easy to dispense profits to members within the LLC as each member is responsible for paying taxes on the income they make from the business. Flexibility – When setting up the structure of your LLC Operating Agreement, you can keep it simple or add as many laws within the company as you see fit. An LLC typically has much less paperwork and meeting requirements than most other formation types. Pass-through Taxation – The business itself is not taxed, instead each member pays their share of taxes for the money made or lost based on personal income. Protection – Members of the LLC are not personally liable or responsible for business debts and liabilities. For this benefit alone is why many people choose to create an LLC over other formation types. There are many professional services out there on the internet offering to help people set up their LLC and the reason being is – it’s actually fairly easy! These services charge you the state’s fee for creating the LLC while also adding a hefty fee of their own for creating the LLC for you. Creating an LLC at first may sound daunting but don’t worry – follow our steps below and save some money by creating it on your own! The majority of companies created in America are local small businesses so naturally it only makes sense to start an LLC in the business’s residing state. You may have heard of a few select states such as Delaware, Nevada, and Wyoming that are favorable due to favorable tax laws and business infrastructures. For example – in the State of Delaware, members of an LLC can be kept secret from the public while only having the Registered Agent’s name being available on public record. Businesses that serve a local demographic should register within their state. Cyber or Internet type businesses, where location of their business has no importance, can research the state that fits their business model best. If you do decide to incorporate an LLC in a different state from which you live, you will need to find a Registered Agent that resides in the same state where you incorporate your business. This is not a difficult task as there are many professional services that offer Registered Agents for hire at a reasonable cost. So, now you have selected a state, let’s start considering a name for your LLC. Ideally, you want to select a name that is catchy and original but more importantly, that it references the niche of your business. For example – Let’s say you are setting up a real estate brokerage in Miami, Florida. Naming your company “Miami Real Estate LLC” would be ideal. With this name in mind, let’s go to the Florida Division of Corporation’s website and do a search of our desired name for our LLC. After entering “Miami Real Estate”, we can see that someone had previously filed for this entity but due to some unknown reason, that person let it go as you can see that it has an “Inactive” status. Names with an “INACTIVE” or “INACT” status are available. This is great news! Because it’s inactive, we can go ahead and file for this name. Helpful Tip: If you are looking to set up a website for your business, you most likely want your website URL to be the same name as your LLC. For example – MiamiRealEstate.com would complement the business name Miami Real Estate LLC and it would look very credible. Unfortunately, that domain name is probably taken. So maybe you alter your business name in order to match it with an available domain name. You can easily search to see if a domain is available by using Godaddy or other similar services on the internet. A Registered Agent is a person either affiliated with the LLC, such as a member, or a third-party who acts on behalf of the LLC to collect all legal notices from the State or other important notices such as a lawsuit. With regards to Single-Member LLCs, some States allow the single member to also act as the registered agent and other states require that a third-party be the registered agent. The registered agent must have a physical address in the State in which the company is located. The address can not be a P.O. Box. Your State will ask you for the name and address of your registered agent when you submit the Articles of Organization. You will also want to list the registered agent on your LLC Operating Agreement. When filling out the Articles of Organization in the State of Florida, this is how it looks. Helpful Tip: If the mailing address of the registered agent changes, you must notify and file the respective paperwork with the State of the change. Failure to do so could result in the dissolution of your company. Each and every State has its own process when it comes to filing the Articles of Organization for an LLC. Most States offer the ability to file online which is the easiest and most convenient option, otherwise, you will need to print and fill out the Articles of Organization by hand and mail it to your Secretary of State’s Office. Correspondence name and email address (Allows the State to email about important notices such as the Notice of Annual Report). Name and address of all members and authorized representatives (Authorized Representatives are members that have the authority to manage or act on behalf of the company. For example – they would have the authority to open up a business bank account for the company). 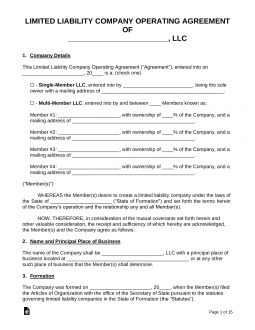 Once your LLC Operating Agreement is complete, give each Member a copy and store it in a safe place. Your LLC must be registered with the State it plans to do business and not on the federal level. The only item that is registered at the federal level is when applying for a Tax ID Number (also known as a Federal Employer Identification Number, or “FEIN” and “EIN”). Single Member – A Company with only one (1) owner. It’s important to have this document, even with just a single owner, as it helps prove entity status if questioned by a third (3rd) party. If a court asked to view your LLC Operating Agreement and it did not exist, it would reflect poorly on your entity and you would run the risk of having your entity status removed. 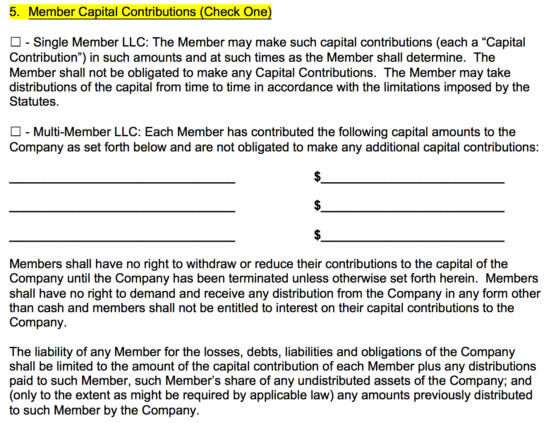 Multi-Member – A Company with multiple owners. All sections of your LLC Operating Agreement should be looked at very closely as it affects all the members of the entity, especially the ownership interest and distribution. Enter your business’s main address, also known as the “Principal Office Address”, where the main functions of the business are located. Also referred to as the “Company Headquarters”. For most small businesses, the address of your main office will suffice. Formation – This is the Date the Company was formed and within the State name. A Registered Agent is an individual appointed to accept any and all notices from outside including official legal notices from the state, which will be sent to the registered agent’s address. It is recommended to elect to have a lawyer assume this position or a person that is a resident of the State the Company is located. Members who have personally contributed to the LLC should have their contributions listed. In addition to cash, if there are any assets (such as vehicles, office furniture, etc.) given to the Company, it should be mentioned for tax and distribution purposes. Distributions – Money sent to members of the LLC generated from the revenue of the business. This is usually calculated as profit or at a figure after paying most of the Company’s operating expenses. The percentage of distribution each Member is entitled to is usually reflected in the percent that the member owns in the LLC. 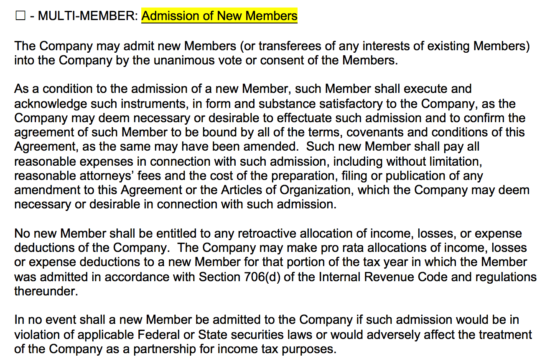 Therefore in the boxes, the name(s) of the member(s) should be entered along with their respective percentage interest. Bank Accounts – The bank account(s) that the Company shall use must have all monies deposited into said account and may only be withdrawn at certain times by the designated Member(s). Management of the Company – The Company may opt to be managed by a member or by a manager that is selected by the member(s). If the Company chooses to have a Manager, then their role, power(s), and interest in the Company should be mentioned. Entities are typically required to meet at least once per year in a location, usually at the company’s principal office. Depending on the Company, this annual meeting can be treated more seriously than others. In some meetings, the minutes must be written stating the items that were discussed along with votes. All minutes, discussions, votes, and any other decisions made should be recorded and placed on file. A clause where rules can be set up about the assignment of ownership in the entity. 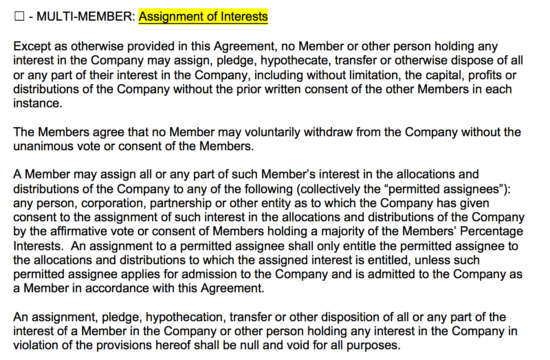 For example, most Companies will require members to offer their share of company ownership to other members within the LLC before attempting to sell shares outside of the Company. With a Single Member LLC Operating Agreement, you can elect to establish the Company as a separate entity where all assets owned are by the LLC and not under the ownership of a sole member. 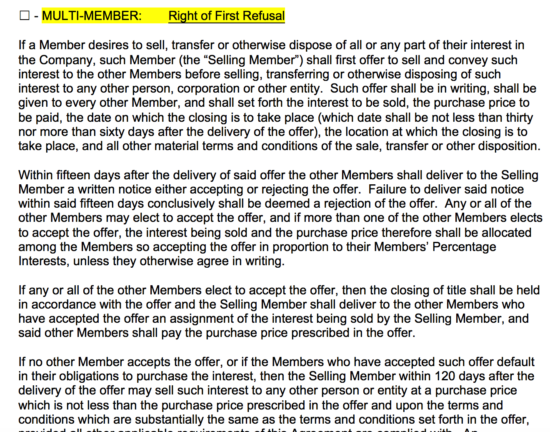 Gives members the option to purchase interest that is being sold by another member before an outside party can make an offer. If any member refuses to purchase for the said price, the outside party shall be permitted to purchase the interest. New members added to your company through any type of acquisition must have consent by fellow members through a unanimous vote. Consent by each member should be in writing. In the event a member dies your company will have 60 days to decide, through a vote, to keep your company active or become terminated. 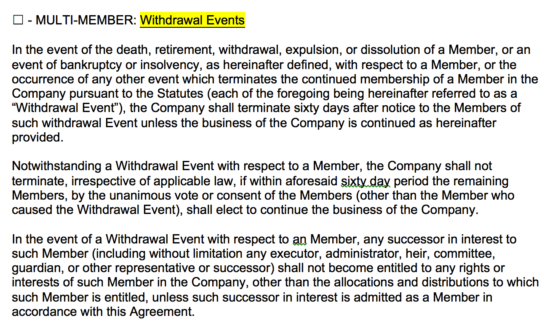 Members are not able to leave the Company in the event it brings on debt or if one member attempts to force out others from the LLC. Dissolution and Liquidation – Members can list various actions that would allow for the dissolution of the Company and the selling of all its assets. Representation of Members – A clause that states the Company is, more or less, for investment reasons and shall follow all local, State, and Federal laws. At the option of the members, they may allow themselves to generate certificates that state their interest in the Company. Only applicable if the LLC decides to produce them. 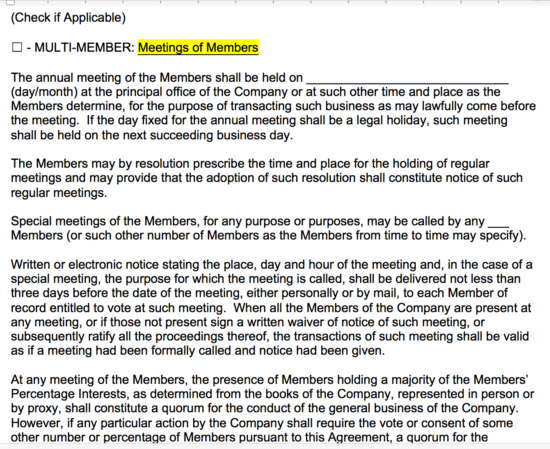 Notices – All communication made to the members shall be sent to the address printed in the operating agreement. All notices are recommended to be completed via Certified Mail. If there are to be amendments or changes to this agreement make sure that there are sufficient rules in place so that no single party can make edits without the approval of majority or all of the members. Indemnification – For single member agreements, the section states that any actions by the Company shall hold the sole individual, and any employees or family members, harmless from any actions taken by the Company. This is within reason and if there has been extreme negligence performed by the member they may still be held liable. Miscellaneous – The last paragraph states that the entire agreement is not bound by any of the terms that may not apply in certain jurisdictions and that if there are any other terms that should be included in the agreement that they are entered in this area.